I’m not fit. I really should not be running the Beachy Head Marathon 2016 having had virtually no training for 5 weeks. This is a ridiculous idea. Furthermore, this is not any old marathon we’re talking about. Beachy Head Marathon has over 1000 metres of elevation with the final six miles climbing over the Seven Sisters. Still, the prospect of coffee at the aid stations, free food afterwards and access to Bede School swimming pool made me think that perhaps I could do it after all. Not to mention the fact that Beachy Head Marathon has great views over the South Downs and out to sea. It’s a lovely marathon. 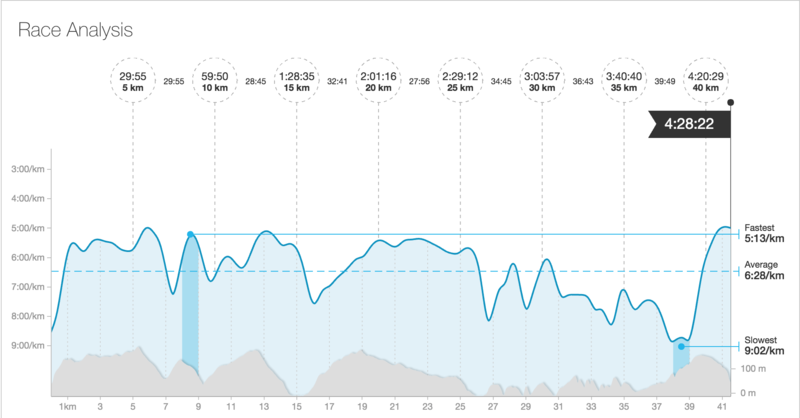 So, by way of a recap, in 2014 the Beachy Head Marathon was the toughest race I had ever done. I didn’t manage my nutrition well at all and bonked badly just before 20 miles, eventually finishing in 4 hrs 55 mins. You can see my film of that day here. Then, last year, I was fit and raring to go. I felt very comfortable all the way round but just missed sub 4 hours, coming in at 4:01. This year was all about testing myself out. How much pain would there be from my injury? How fast could I run and for how long? Would I implode before reaching the Seven Sisters? There was to be no camera today. I needed to concentrate on my body and getting round the course. My regular running buddy, Richard, is still out with a hip/glute injury, so I travelled to Eastbourne with Tom, Phil and Simon. Tom and Phil are currently in blistering form and I had decided very early on that I would not be attempting to keep up with them. Fellow Worthing Harriers Lesley and Sharla were also running. The Beachy Head Marathon 2016 would be the 37th running of the event and it really is one of THE races to do in the South East during the year. Consequently, pretty much everyone was there. I recognised so many runners from other clubs and other races I’ve done. Long before I was a runner the race was known as the Seven Sisters Marathon, but I do recall knowing of its existence when I lived in Eastbourne. It became Beachy Head Marathon in October 2002. The race originally started as a rambling event in 1981, which is why to this day, the aid stations serve tea and coffee, cake and bread rolls. Once upon a time, no one had even considered that runners might like more than just water and Jelly Babies. These days it’s like stopping at a cafe at Centurion and White Star events…..which is great, I’m not complaining. But it’s just interesting to think back to what it was like for runners doing trail marathons back in the day. There’s a great page listing the full history of the event here. Suffice to say, as well as the name change, there have been alterations to the course. In 1986 the route was extended to make it a full 26 miles and an extra hill added after 2004. It’s the one after crossing the road at Exceat. Stuart Mills from Trail Running Sussex has won the event 7 times, winning last year’s race in 3:08. The course record was set in 1991 by Mike Bradley, who ran the pre-2004 course in 2:45. Tim Short ran 2:47 in 2007 after that extra hill had been added. Stood at the start next to Bede School at the foot of Beachy Head, Tom tried to convince me to go for a sub 4 hours with him and Phil. I politely declined! I was very aware of looking after myself on this run. I started very conservatively, jogging very slowly up the first hill and keeping it very steady past the ever present bagpipe player, (every year since the beginning I think) at one mile. I felt good down through Jevington and up, out the other side. We went down again into Alfriston at 9 miles and over that lovely white bridge, before the next big climb out, following the South Downs Way. There was no view, unfortunately, because the mist was pretty thick on the top of the hills. So much so, that at one point I was concerned to keep the runners ahead in view for fear of losing the path. In fact, it reminded me of running the same route in the opposite direction during the South Downs Way 100 back in June, in the dark with thick fog and visibility down to a couple of metres…..at 2am! There’s an aid station just before half way, where the route turns to head back towards the coast. I made it here in just over 2 hours still feeling good. There are then 3 or 4 miles of flat, fast running before the drop down into the ancient village of West Dean, where King Alfred the Great had a palace in the 9th century and, more importantly, where we find the first aid station in the race with coffee!! I love that aid station with a passion. There’s always a band there too and it feels like a milestone point in the race. It’s not far then to the next milestone point at Exceat but, to get there you have a bit of climbing to do. One hill out of West Dean and then two sets of steps through Friston Forest. At 20 miles you reach the Cuckmere Valley and the next ancient village on our tour. Exceat actually no longer exists. It was abandoned after the Black Death decimated it in the 1300s. Up until then, Exceat and West Dean were more important places even than Lewes, due to their positions along the navigable Cuckmere River. I crossed the road at the Cuckmere Valley Visitors Centre and ran confidently up the hill towards the start of the Seven Sisters. By now, I was starting to think I could do this in a pretty decent time. 4:15? Maybe even 4:10 if things go well. I began to give it some real effort. I flew up and over the first two sisters and then over another. However, on the fourth sister, I think I went a bit too hard and near the top, I suddenly felt the legs go. I didn’t fall over. I mean the energy went. I hit the wall, if you like. I had gone too hard over those first few sisters and all of a sudden I had nothing left. I stopped for a wee just before the aid station at Birling Gap and then drank too much coffee there. I began to get gastric issues discomfort and I knew I was done. I just had to get back now. For the last 3 miles, it was a case of run-walk to get home. It was a relief to reach the top of the final climb at the Beachy Head Pub. I was able to pick up the pace a bit to get down the hill to the start finish with the knowledge that I might scrape in under 4:30, which I did, crossing the line in 4 hours 28 minutes. Team mates Tom and Phil had a ding dong battle. Although Tom crossed the line first, because Phil was behind Tom at the start, the chip times give the win to Phil by 5 seconds! Sharla and Lesley finished together in 5:30. The winner, Sam Humphrey in his first Beachy Head Marathon, finished in 2:50! Amazing time but still only 4th in the list of fastest times. Seven-time winner Stuart Mills finished in 5th with a time of 3:06. I enjoyed the pool afterwards but couldn’t face eating any of the free food. It’s regularly an issue for me and is very annoying when there’s free food on offer! All in all a very enjoyable Beachy Head Marathon 2016. I’ve learned that my injury is all but gone as I had no after effects to speak of. I am not as fit as I could be by any means but I haven’t totally lost it and it’s onwards and upwards from here. I have a plan. I wonder if next year I can persuade both my wife and my eldest son to make this their first marathon? If I could cross the line next year with Hallum on one side and Victoria on the other that would be amazing. Watch this space as they say…. Finally, if you’ve enjoyed this Beachy Head Marathon 2016 race report please do share it or give it a ‘like’. Also, I am having a bit of a push to get people to subscribe to the YouTube Channel, where you’ll find all my race films, training videos, documentaries and reviews. You can subscribe by clicking here. Thanks for reading.